Last year I made a pumpkin loaf to give out for Christmas. 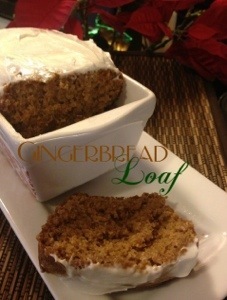 This year I went with a gingerbread loaf. It was simple, tasty and made the entire house smell of Christmas. My nephew loved it so much he pretty much attacked a mini loaf and almost ate it all himself. In a large bowl, combine dry ingredients and whisk together. In a separate bowl, combine eggs, milk, syrup, molasses and oil. Stir wet ingredients into the dry ingredients until moistened. Pour batter into two greased 9-in. x 5-in. loaf pans or seven mini pans. For regular size loaf pans, bake for 60-70 minutes or until a toothpick inserted near the center comes out clean. For mini pans, bake for 30-35 minutes or until a toothpick inserted near the center comes out clean. Cool for 10 minutes before removing from pans to wire racks.